Four MBS students take on the challenge of addressing employment and social inclusion challenges faced by the indigenous population in Shepparton. Recognising a need for increased inclusiveness of the indigenous community in the region, the Kaiela Institute, established in 2011, aims to bridge this disparity by educating and encouraging cohesiveness between the indigenous and non-indigenous populations, reducing the disadvantages currently felt by the indigenous locals. 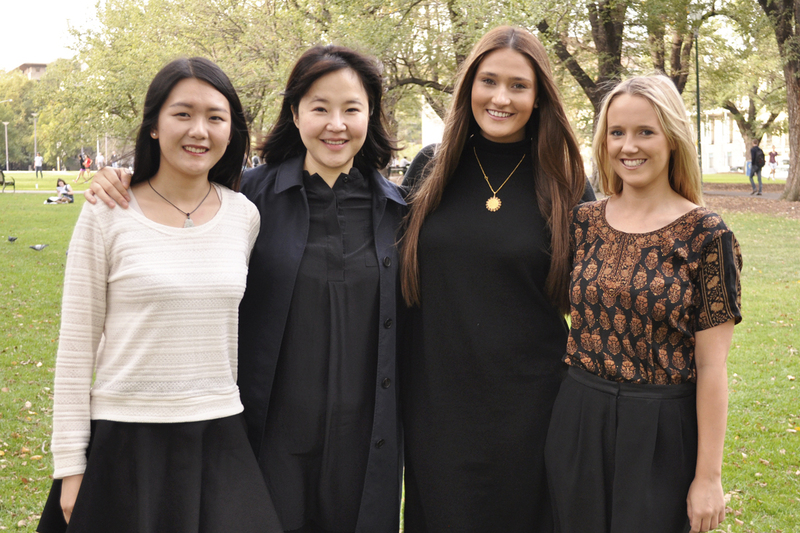 Melbourne Business School Masters students Georgia Courtney, Chelsea Quilty, Jiaqi Rao and Aerim Yi, all in their final year, were asked to address gaps that could arise between the employment generated through the signing of accords. There is an acknowledged difference between employment generated through the accords and the actual ability for the indigenous community to provide this need. For example, do 2 per cent of the population have the skills, education, experience to take up generated, increased employment? The team also had to consider other initiatives required to ensure that this employment (should it be available) is actually sustainable and that it does not revert to less than 2 per cent. These initiatives included cultural programs for employers, increasing cultural safety, and support for the indigenous community. The team also assessed the feasibility for the indigenous population to meet this increased demand while sustaining positions in the long term. They undertook this research for the Kaiela Institute as part of the Melbourne Business Practicum (MBP) subject. Feelings of disparity and disconnect between their community and the wider Shepparton community are felt among the indigenous people of all ages in this area. This contributes to a perception of being at a disadvantage across many variables, employment being one of them. Chelsea Quilty . Among the many issues reported as being faced by the indigenous community, the most prominent of all is the current employment disadvantage and perception of disproportionate employment opportunity observed within the Aboriginal community when compared with the wider community. In their bid to strive for indigenous economic empowerment channelled through increased employment, the Kaiela Institute has recognised the need to overcome multiple barriers that currently prevent the existence of employment parity. One significant challenge lies in devising strategic plans to create a more sustainable future for both the regional Indigenous and wider communities. Here is where the MBP team stepped in. The MBP team started with an induction week on campus in Parkville, which included lectures with subject coordinator, Sujay Nair, and teleconference calls with the Kaiela Institite to determine the initial scope of the project. The team’s resulting research proposal suggested investigating barriers to employment. They then spent two weeks in Shepparton, working within the Kaiela Institute to conduct in-depth situational analyses, with the aim of gaining a better understanding the indigenous community, industries and employment patterns in the area, as well as the educational resources at hand. The main focus of the group was to determine the current perception of employment-skill readiness of the indigenous community within the Goulburn Valley. To do this, the team first studied the highest employing, and growing, industries to examine industry demand in skills. ‘Supply’ was determined by surveying the local, indigenous people of Shepparton. The aim was to establish how they perceived their own skills, educational levels, barriers faced in job-hunting, and the degree of cultural indigenous involvement. Implemented socio-economic market research through customised surveys, the team was able to explore the issues in detail to successfully translate key findings into recommendations for strategies to provide sustainable recommendations to drive long-term economic participation of the indigenous community in the area. The Kaiela Institute to devise a comprehensive indigenous community database. This would allow them to track the indigenous population through education and employment. It would serve as a tool to allow the Institute to take ‘ownership’ of community data and foresee potential crises within the population. Include a support service centre to the existing proposal for the Munarra Centre for Regional Excellence. A career guidance and support centre will guide aspirations, career paths, and empower career development within the community, allowing the local indigenous people to feel more aligned with employment demands. Marketing campaign run by the Greater Shepparton City Council during Reconciliation week, both lending a voice to the local indigenous people, as well as promoting regional integration to lessen the feelings of cultural isolation within the indigenous community. What was it like living in Shepparton? Jiaqi: Living in a rural region of Victoria was a first for me since my arrival in Melbourne a year ago. Having been told that Shepparton was ‘very country’ Victoria, and mainly clueless about the culture of the indigenous people, I’d actually imagined that living in Shepparton might have involved being in the wild, sleeping in fields and worried about my safety! However, upon arriving at Shepparton, I found that it was actually a lovely town: well-equipped, neat and central, friendly residents. Our host company, the Kaiela Institute, provided us with good working conditions and were always ready to help. Personally, the most significant difference between Shepparton and Melbourne is the quietness and amount of nature. After a busy day hard at work, the best form of relaxation was taking walks around the park, cooking together, and chatting, which quickly strengthened the friendships. My two weeks in Shepparton has been a truly unique experience! What did you get out of this experience? Aerim: To undertake our project, we had to conduct a vast amount of research, such as the Indigenous community, culture, history, the industry within the region and the education status of Indigenous people. The research seminar held in the MBP induction week was very useful in helping with where to start, as research is not an area I was familiar with, but I learnt a lot throughout the project and am quite confident in my research skills now. I also learnt how to design surveys to collect primary data, as well as converse with the local indigenous people. I found that hearing from them in person was more insightful than reading up on their culture and history. I also found it amusing to observe what my team members preferred to prepare for dinner each night; it was interesting as we are all from different, diverse backgrounds! Why do you think the Melbourne Business Practicum is an valuable experience? Chelsea: I found the MBP to be a personally rewarding experience because I was able to translate academically acquired skills and knowledge to a practical and realistic environment. Additionally the MBP gave me the opportunity to enhance my business comprehension and professionalism, expand my intellectual capabilities and further my cultural understanding. Finally this experience enabled the establishment of numerous meaningful relationships, which I will continue to call upon at both a professional and personal level. Do you have any follow-up plans with the Kaiela Institution? Georgia: Executive Chair of the Institute’s Board of Directors, Paul Briggs has extended an invitation for us to return to the region and undertake a tour of the Yorta Yorta lands. I am very keen to take him up on his offer, as is the rest of the team. The group has also made plans to return to Shepparton for the Dungala Kaiela Oration, a significant event held by the Kaiela Institute in July each year. I don’t think this will be the end of my involvement with the Kaiela institute, and would love to return at another point whether it be to work on another project or in a volunteering capacity.